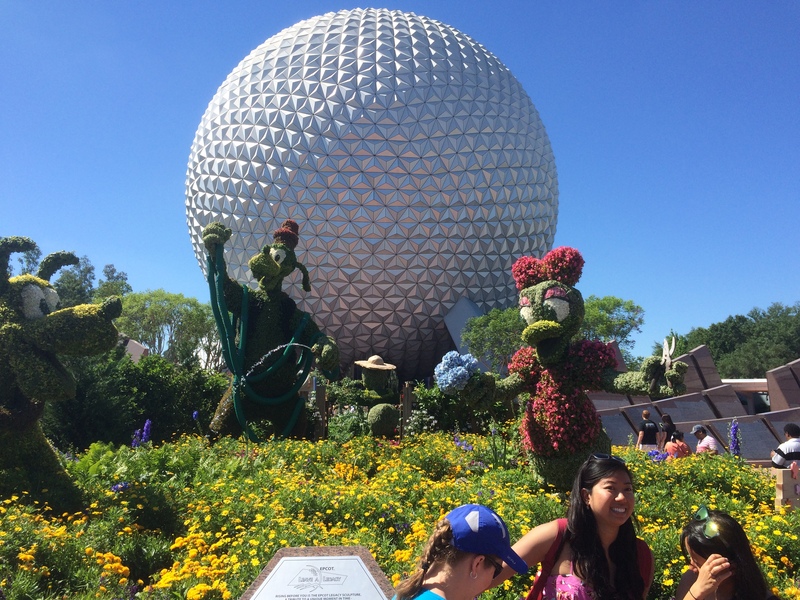 On the fourth day during our spring trip to Walt Disney World, I got to experience the Flower and Garden Festival at EPCOT! 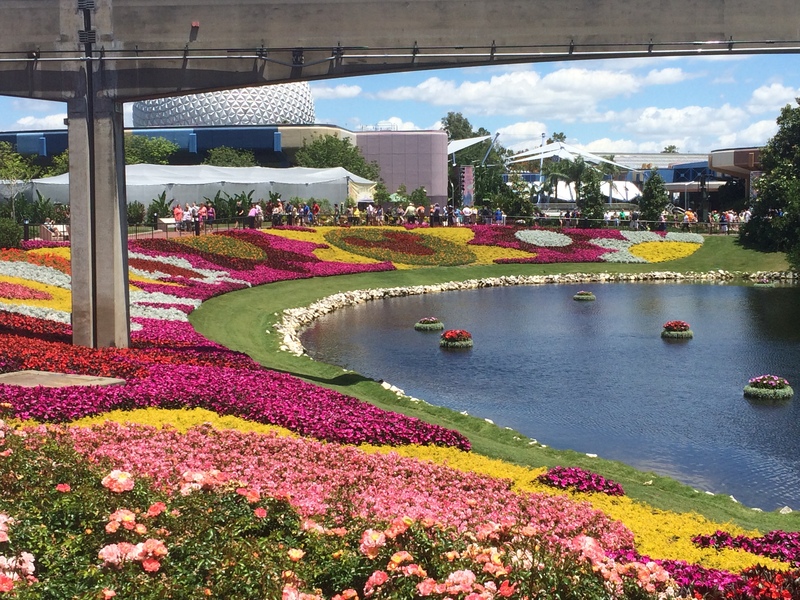 I’ve never been at EPCOT in the spring before. So, this was a first for me. 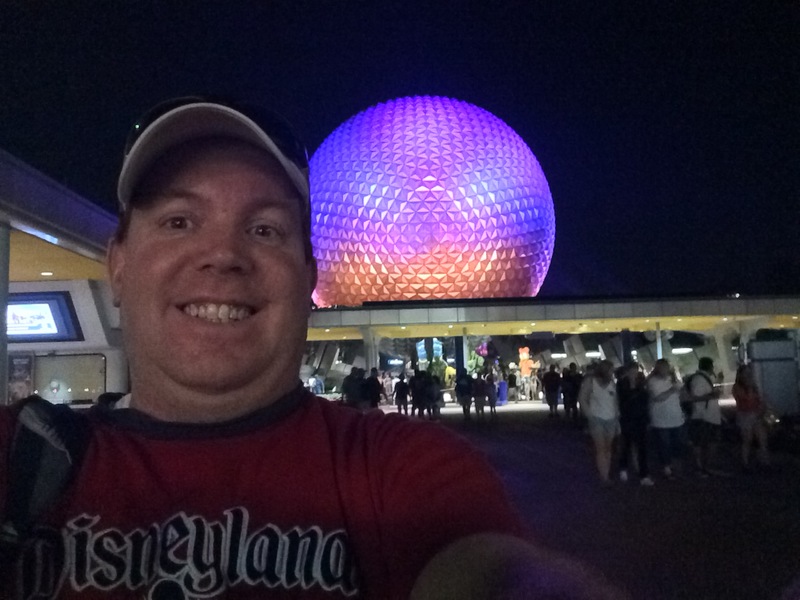 After such an amazing day of exploring Disney’s Animal Kingdom and taking in Avengers: Age of Ultron I was looking forward to a day at EPCOT. 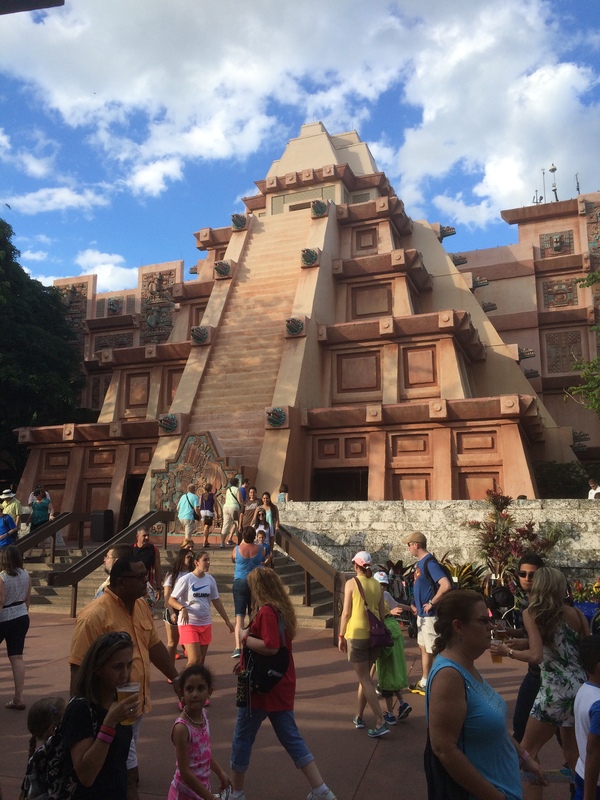 This is my favorite of the Walt Disney World theme parks. 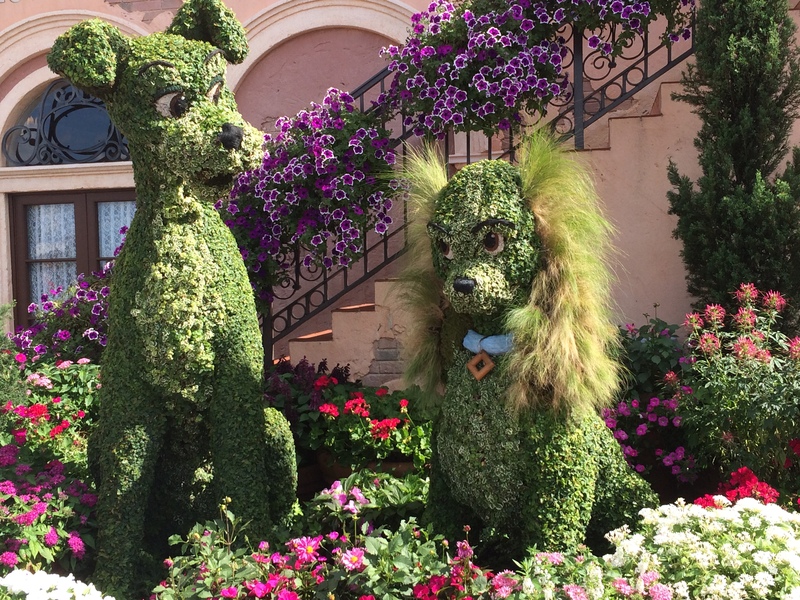 The extra topiaries made an already awesome theme park even better. 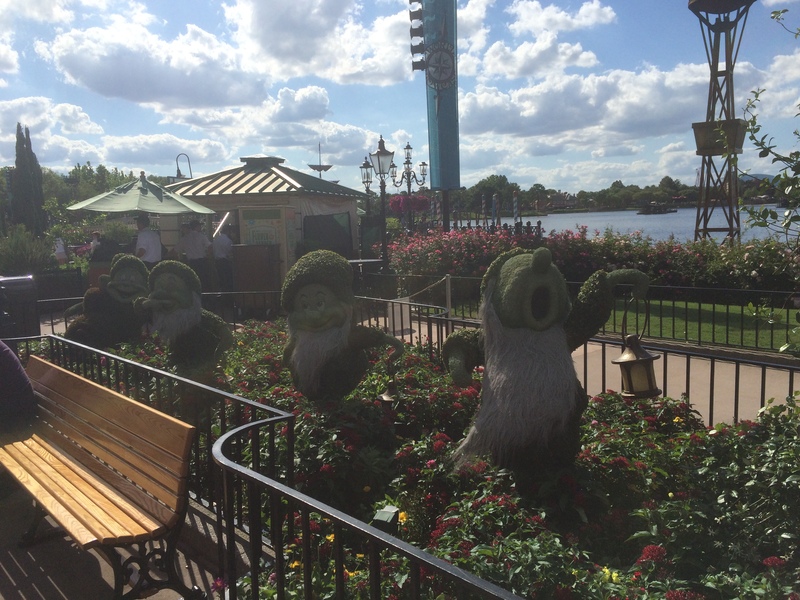 The topiaries began right at the entrance. 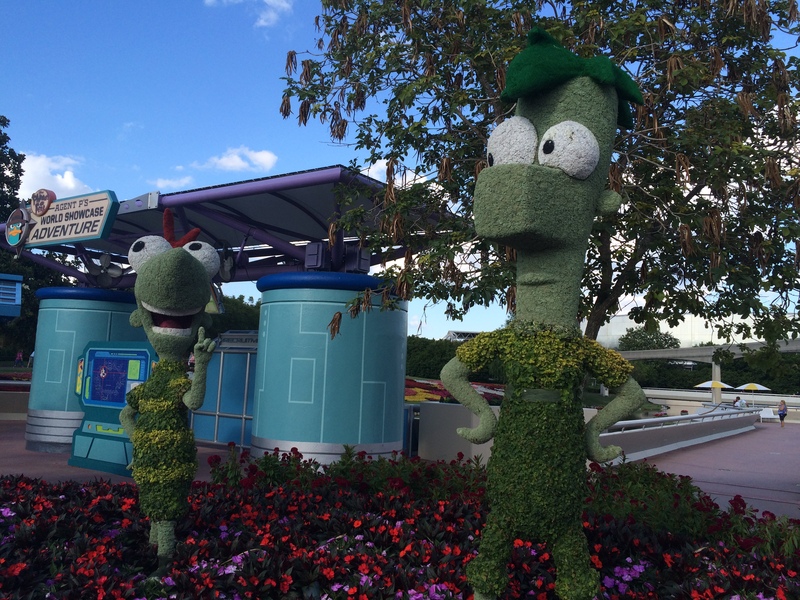 On the map for EPCOT, all the topiaries are listed so you can make sure you see all of them. In the front were Daisy Duck, Goofy, and Pluto. 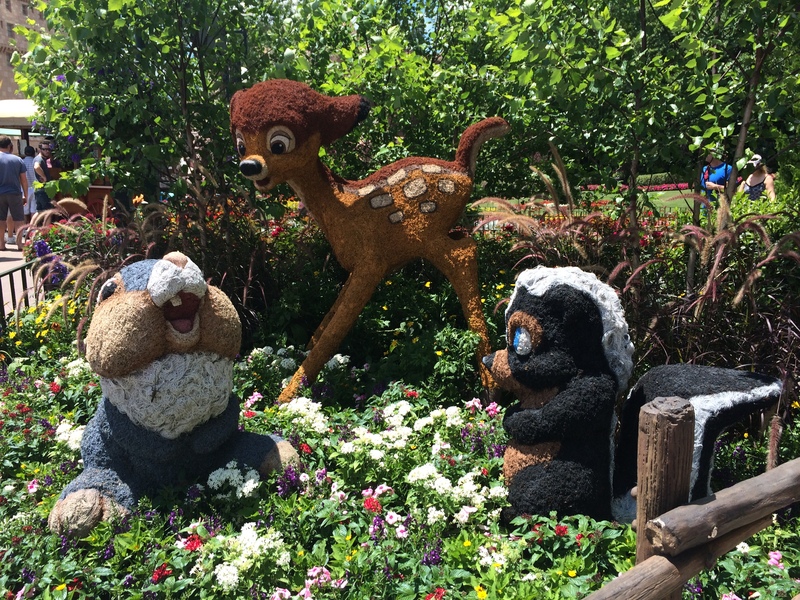 Just behind them were Donald Duck, Chip and Dale! 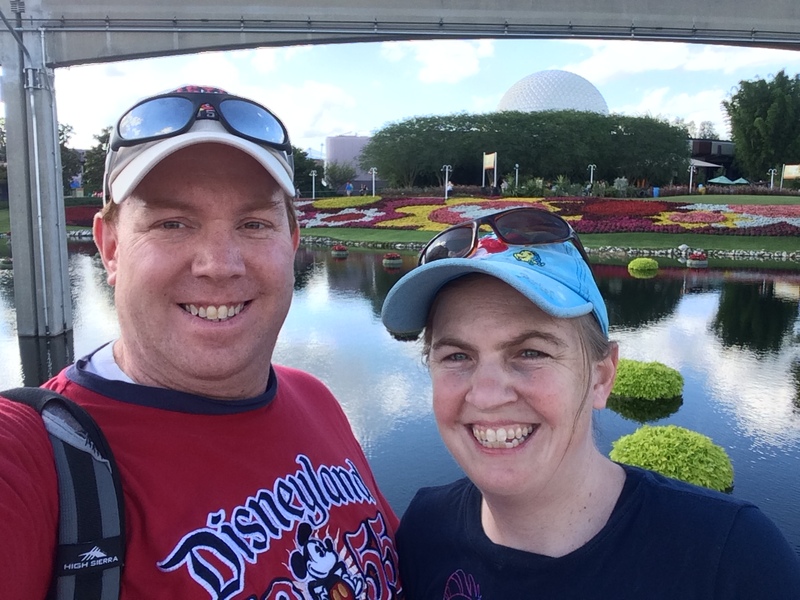 After getting the necessary photos, we hit up Spaceship Earth. 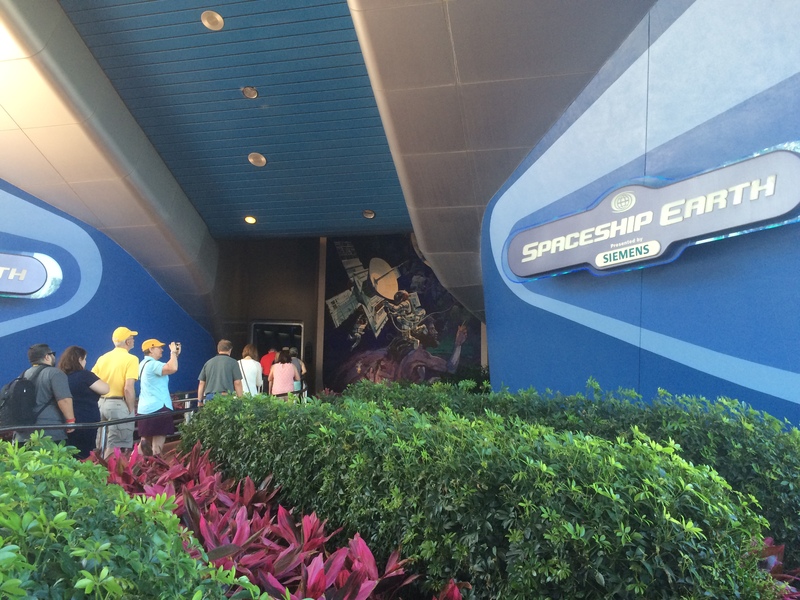 Even though this ride is not a thrill ride, I think Spaceship Earth is a must ride if you visit EPCOT…especially for the first time. 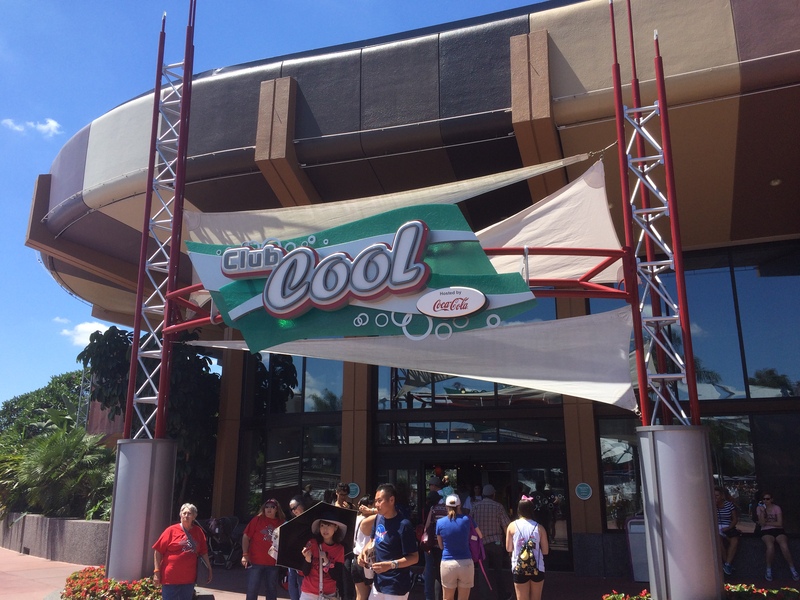 After Spaceship Earth, we went to a place I’ve only read about before…Club Cool. 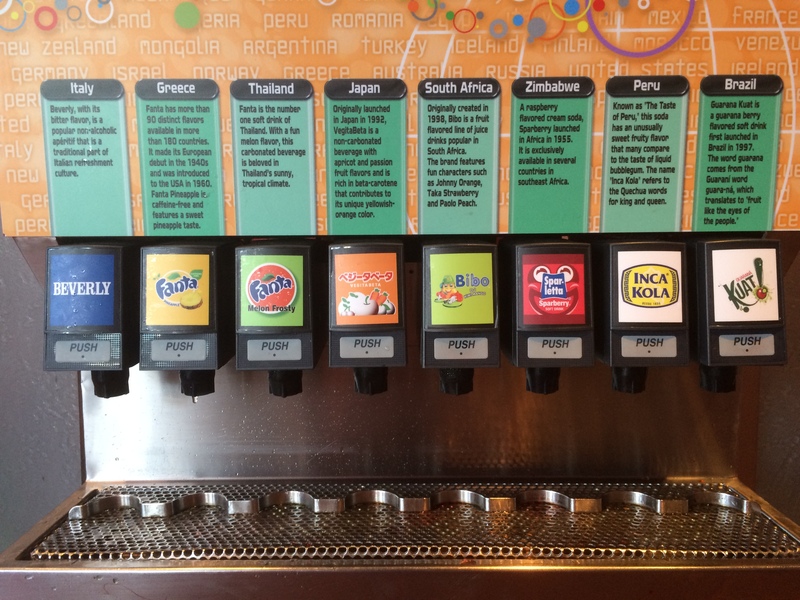 Inside, they have free samples of sodas from around the world. Yep…FREE! We all made sure to sample each and discuss which ones we liked and disliked. All were in agreement that the soda from Italy was the worst tasting. I don’t think any of us took more than one sip of that one. It was way too bitter. The two favorites were from Japan and Thailand. After tasting some soda, some of the ladies needed to use the restroom. 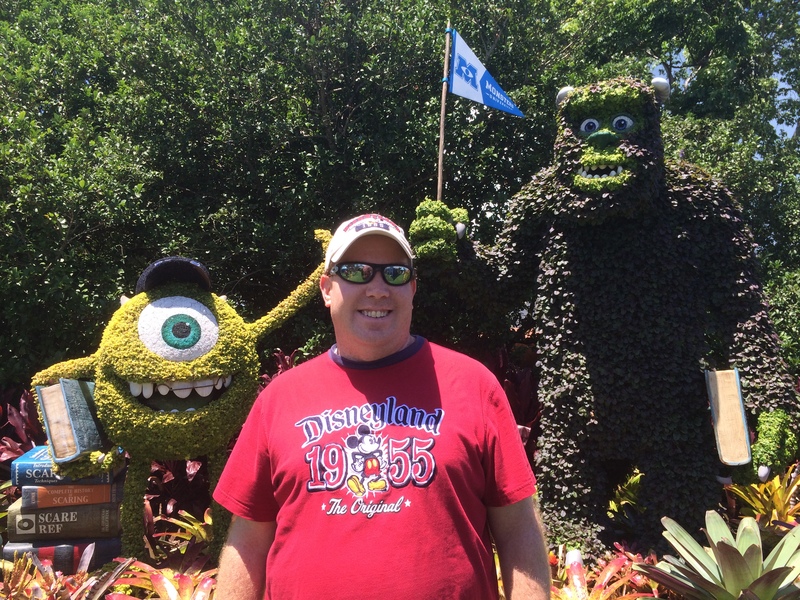 The nearest one was right by the Sorcerer Mickey topiary. 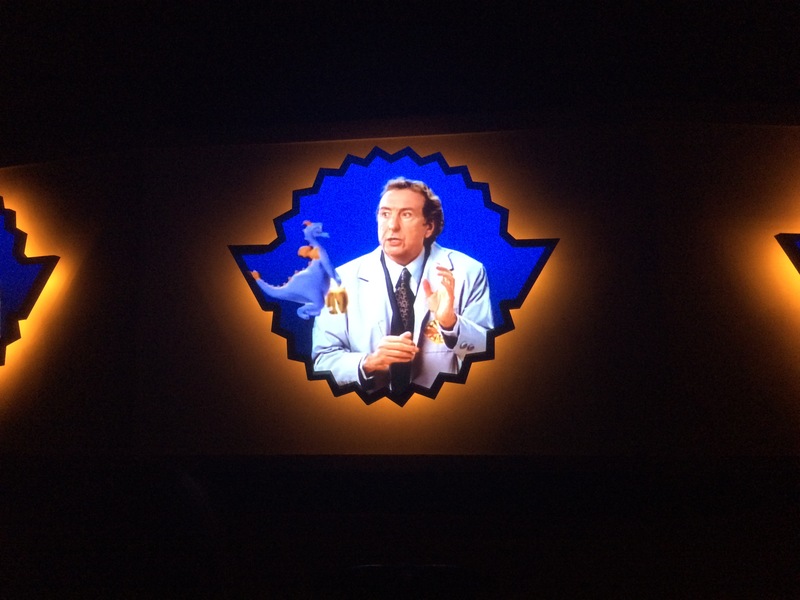 Then, we were off to another attraction I’d never experienced at the Imagination Pavilion. 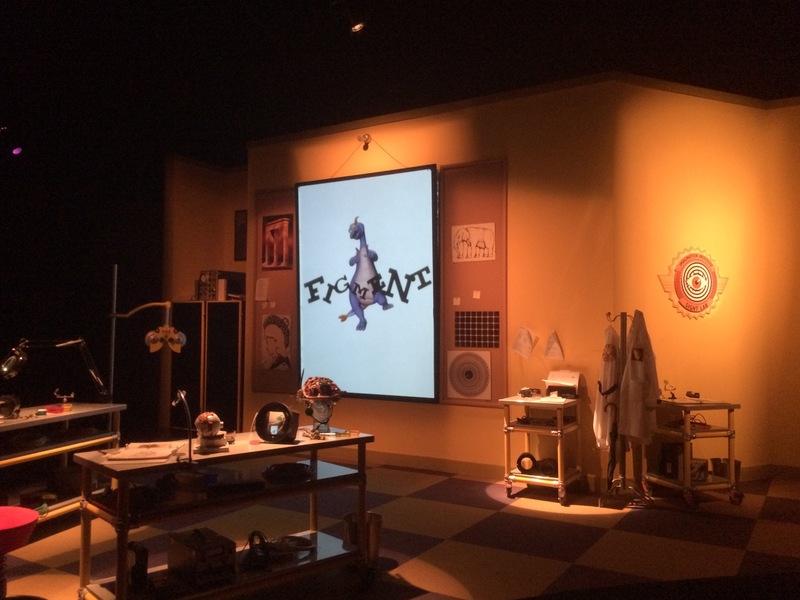 with a new favorite character of mine…Figment! After just one ride through this attraction, I’m a fan! 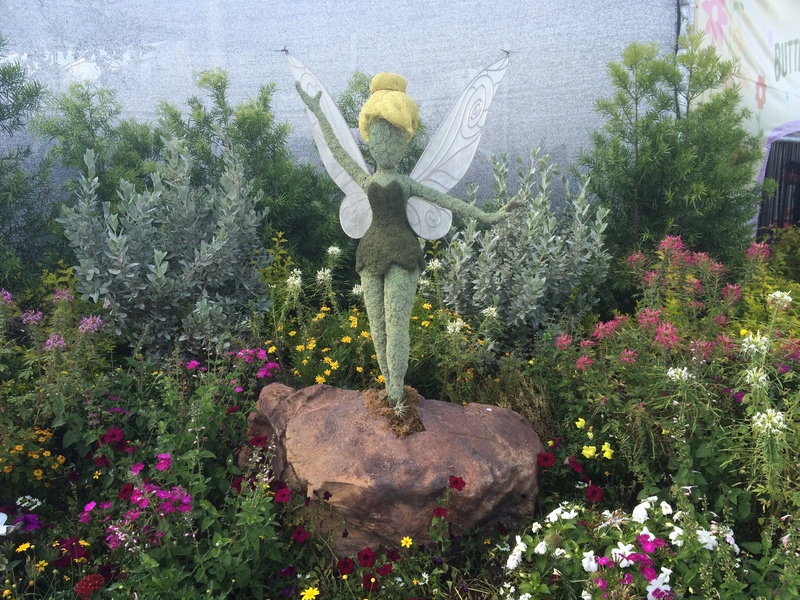 The flower and garden festival is not all about topiaries. 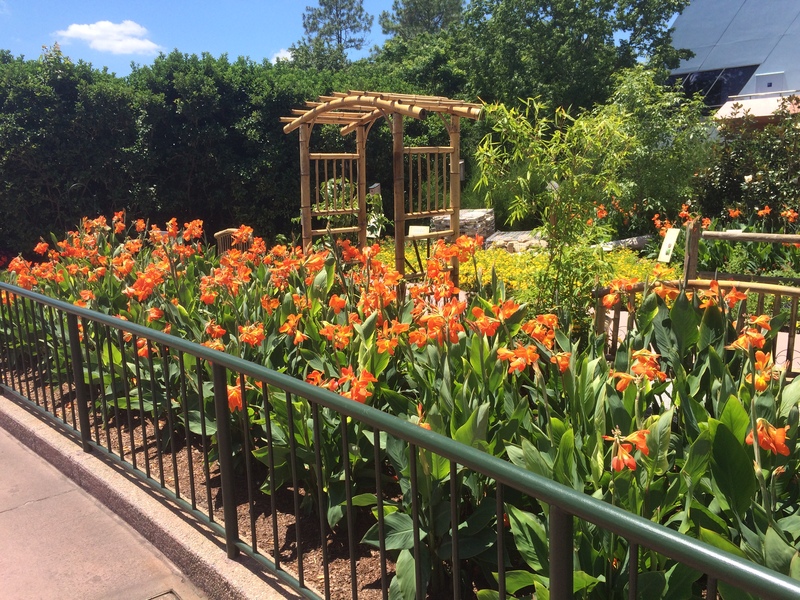 There are plenty of extra flowers in the park. I love all the extra coloring! 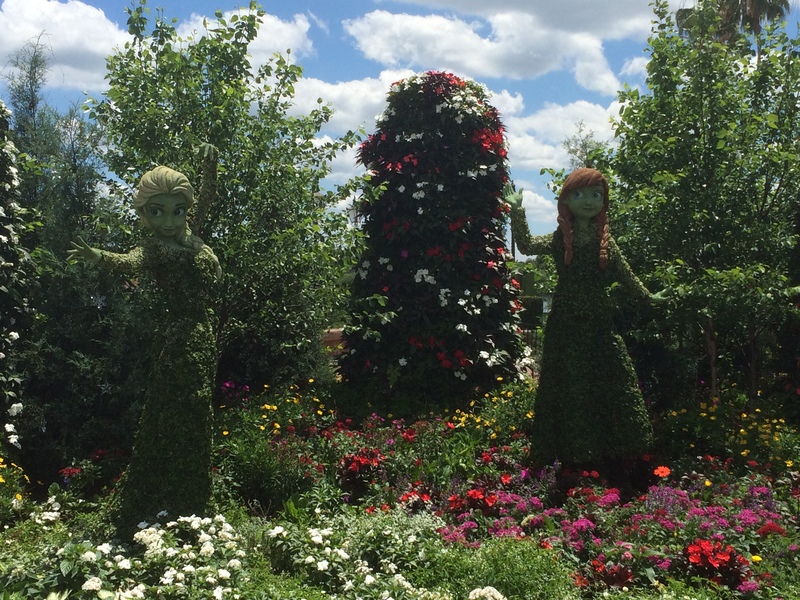 Of course, every Disney event needs some Anna and Elsa. 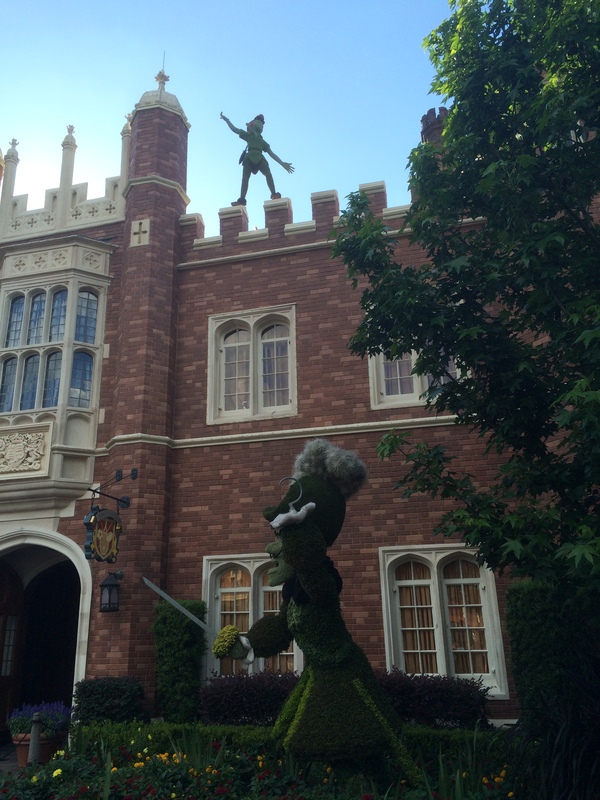 One of my favorites was Peter Pan and Captain Hook. While we were in Jolly ol’ England…or at least the United Kingdom Pavilion, we decided to visit Christopher Robin’s room. That’s where we ran into Tigger. 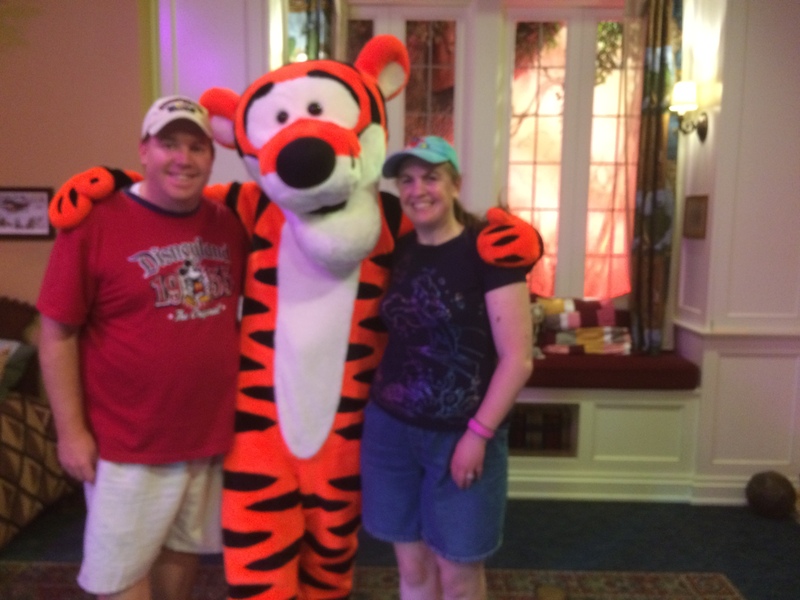 You know what they say…Tiggers are wonderful things! 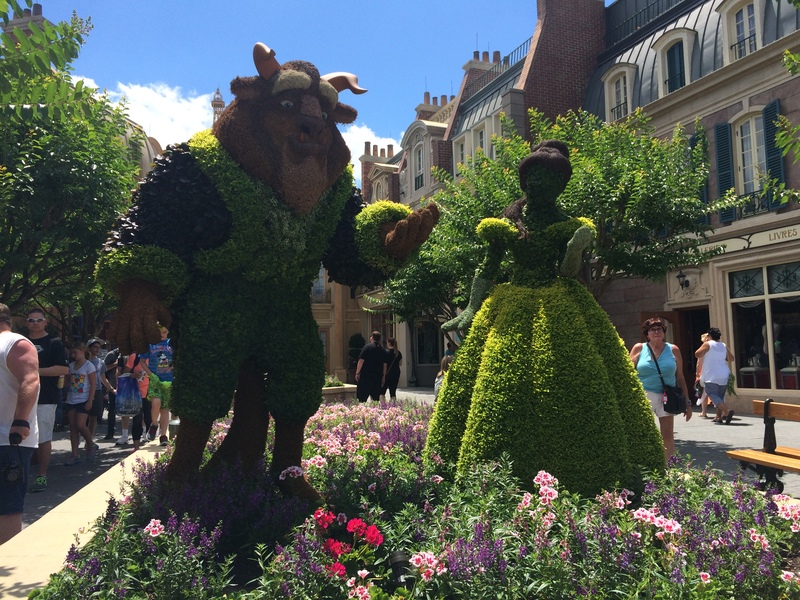 Over in France, we saw Belle and the Beast! 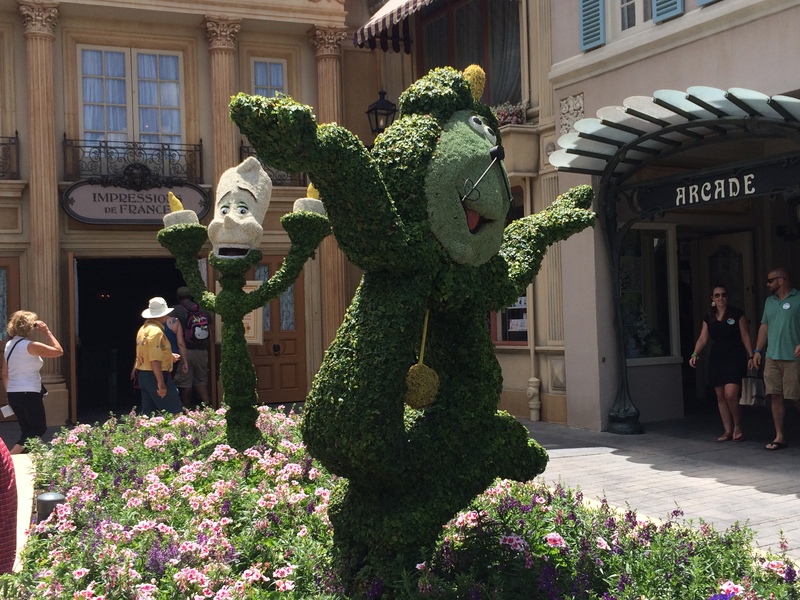 Then, there was Lumiere and Cogsworth! 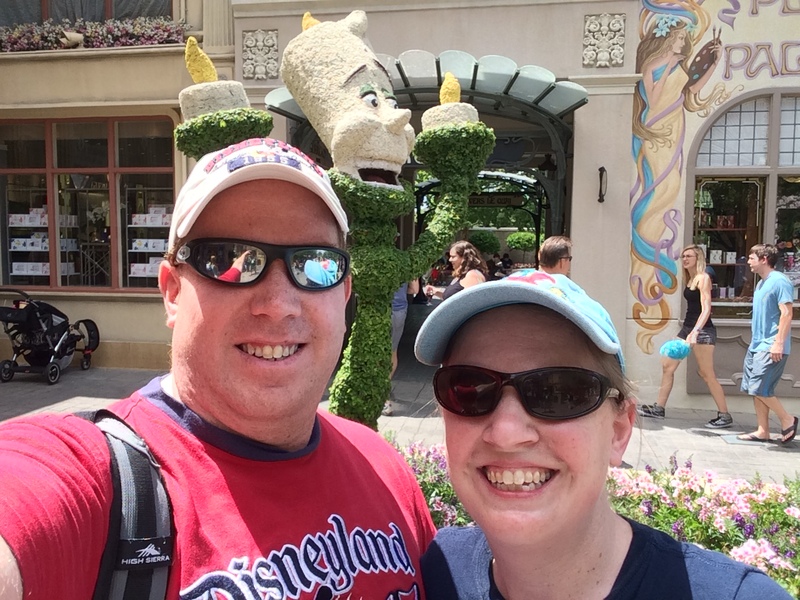 Of course, we had to stop for some selfies! Also, around France was Cinderella and her Prince. Some of the ladies wanted to eat in Morocco. Brooke and I had other ideas. 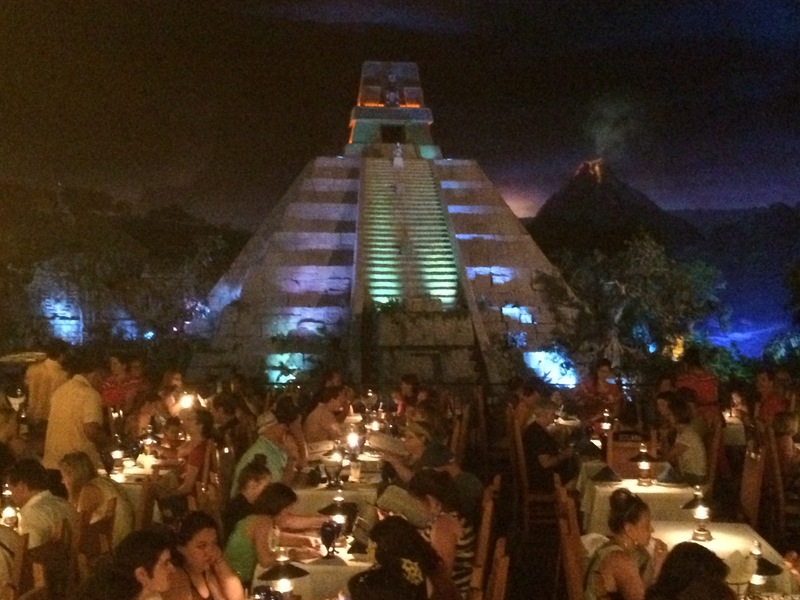 Unfortunately, because we were doing this trip on the fly, we made no advanced dining reservations. 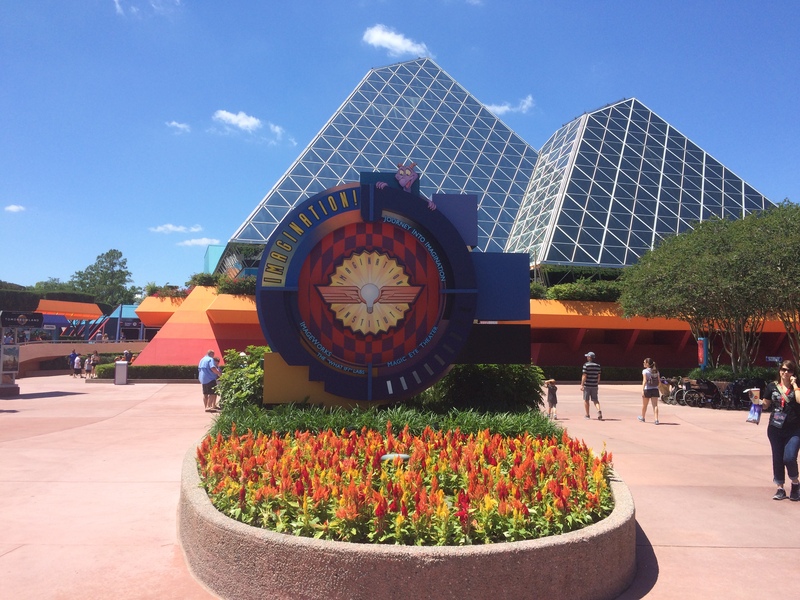 At EPCOT, it is hard to find places to eat without them. 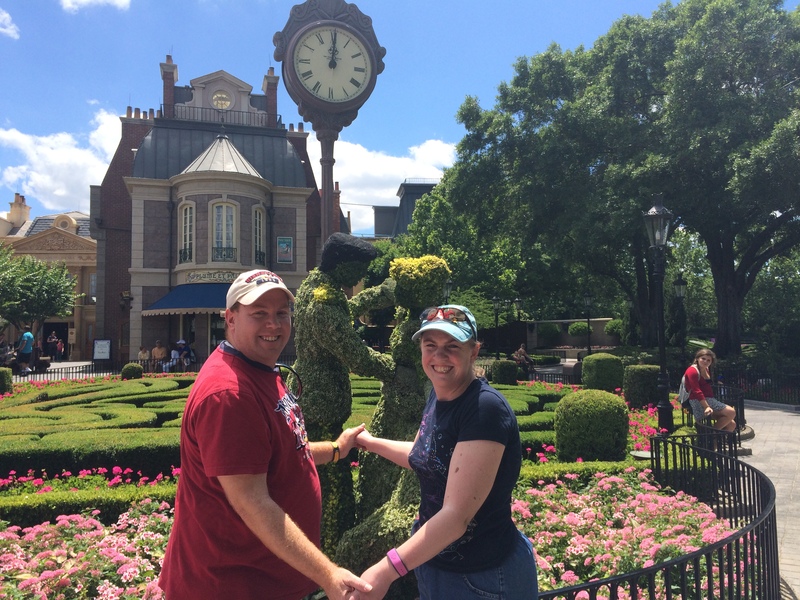 So, we headed to the American Pavilion for lunch. 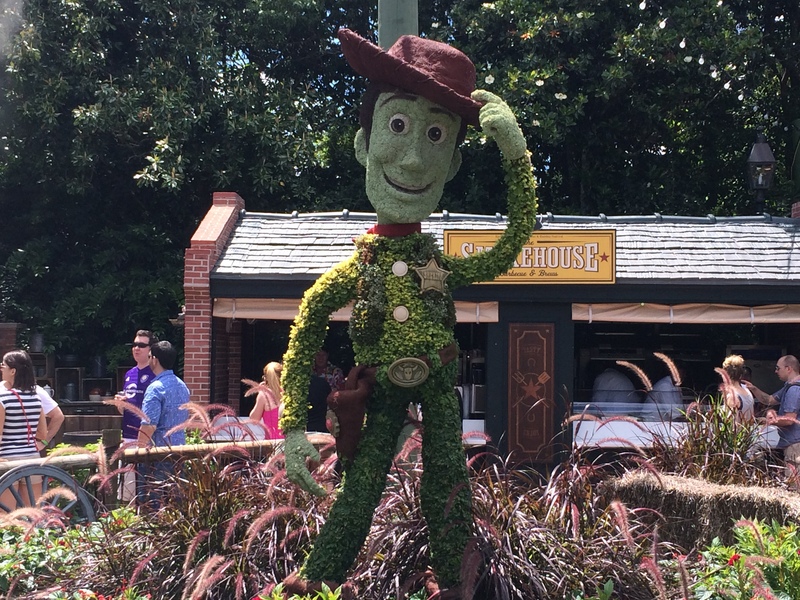 Along the way, we saw Sheriff Woody! 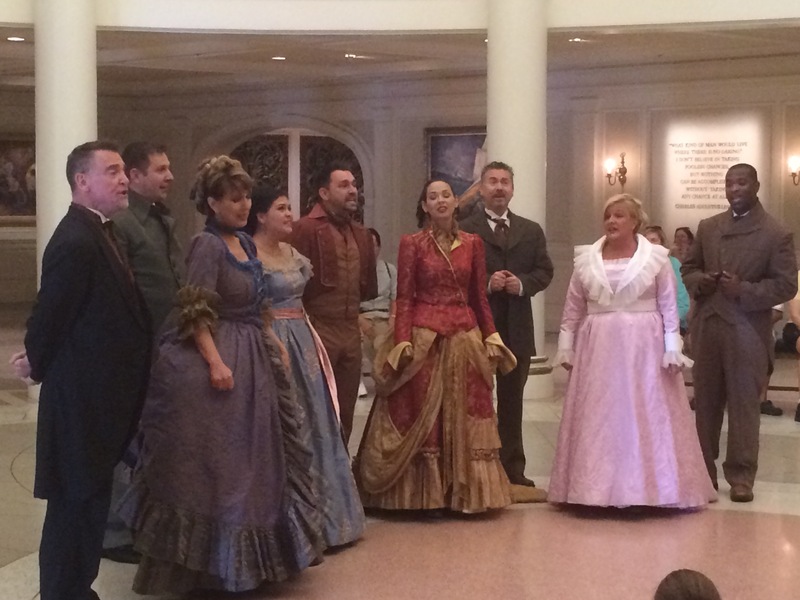 After lunch, since we were in the American Pavilion, we made sure to see the Voices of Liberty. If you’ve never seen them, you’re missing out. This group was as amazing! 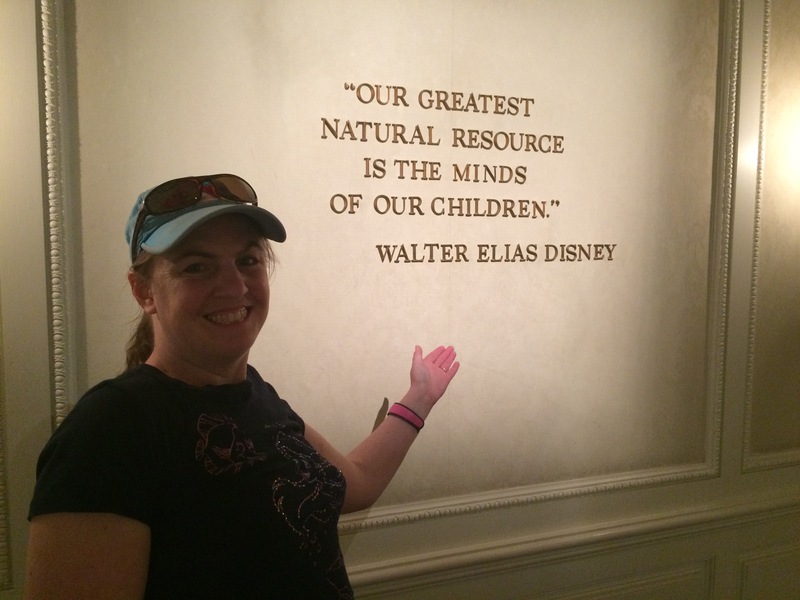 On the honeymoon, we discovered this saying. It fits Brooke perfectly! She is a teacher after all. Then, we continued our world tour. I love Italy! What would Italy be without Lady and the Tramp? 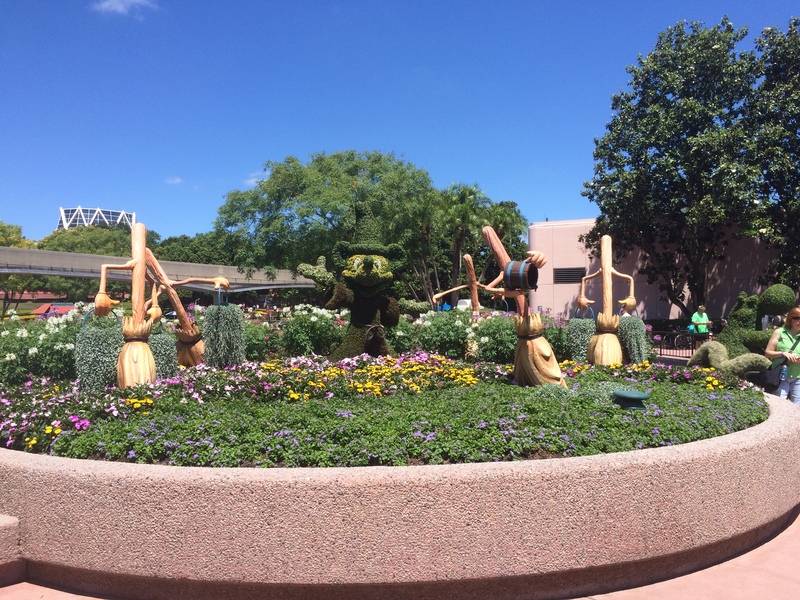 Seven Dwarfs! I couldn’t get them all in one picture. 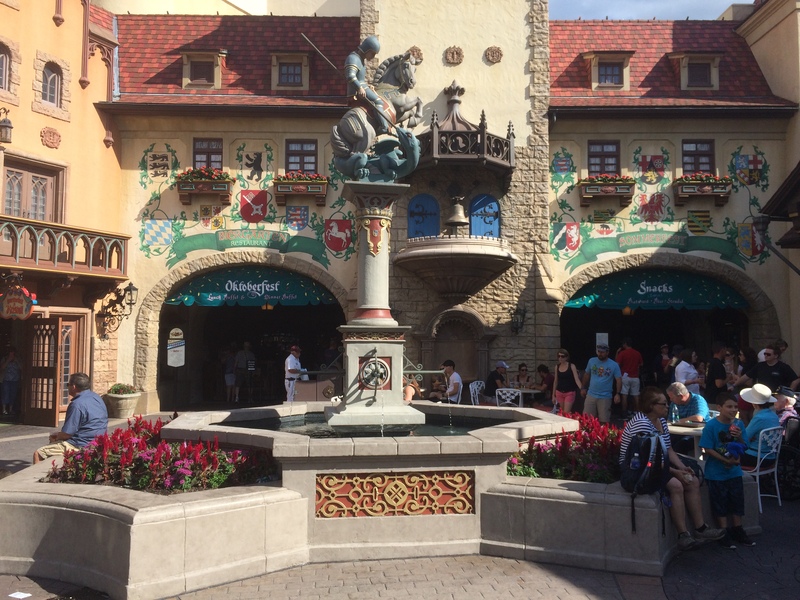 The Germany Pavilion is pretty cool! 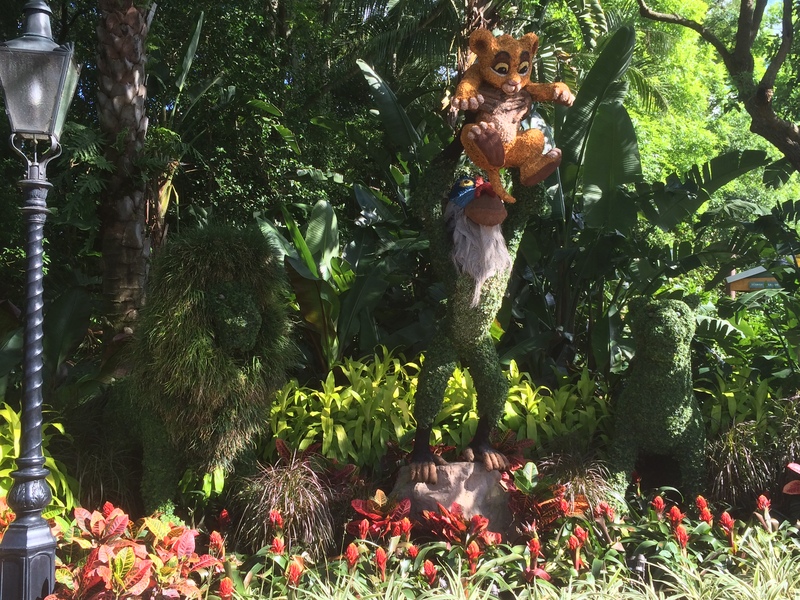 Then, we came across Rafikki, Simba, and Nala. 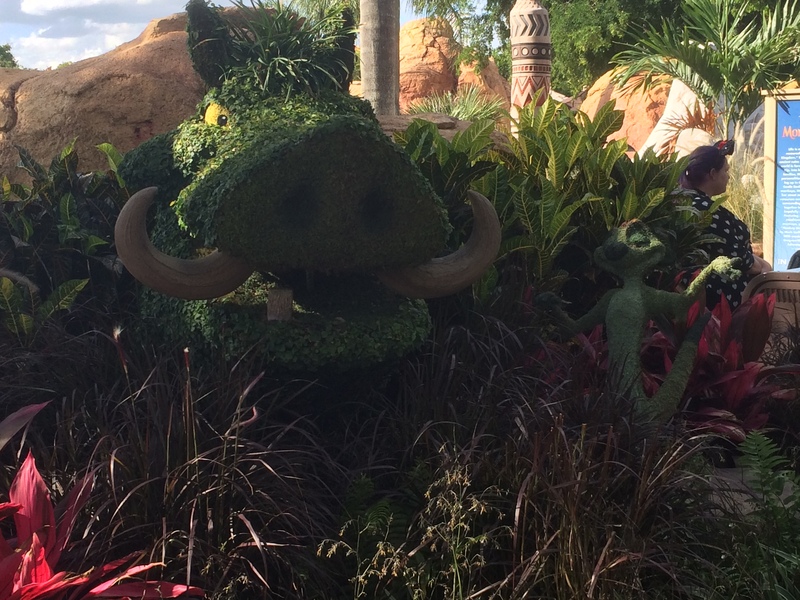 Timon and Pumbaa were right across the way! 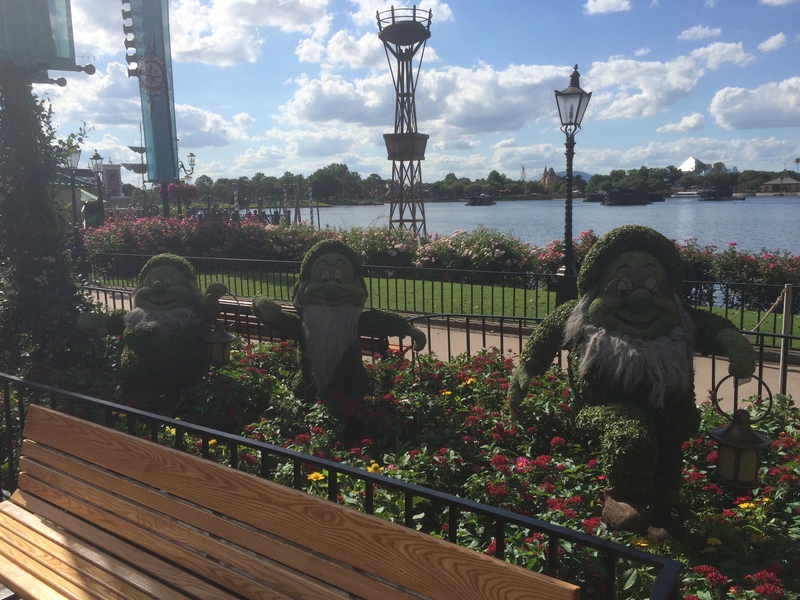 By the time we got here, Brooke and broke off from the group because we wanted to see all the topiaries. 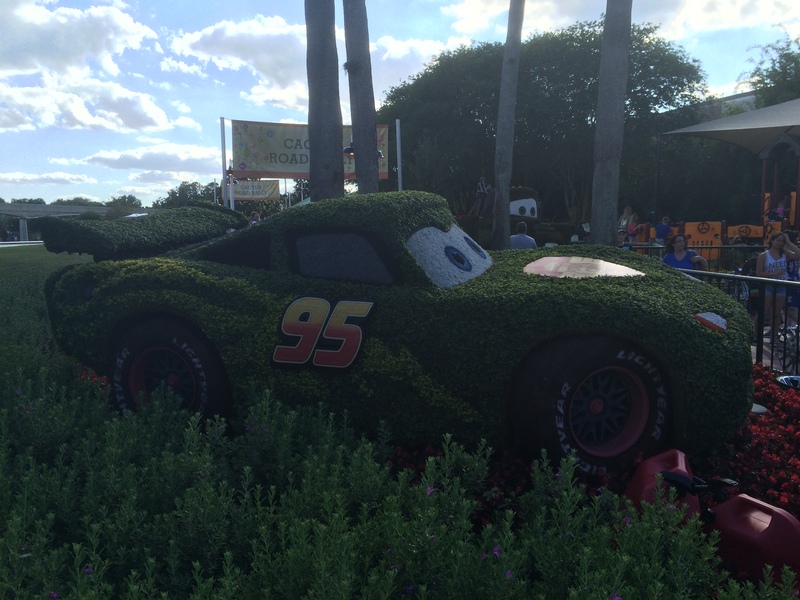 Lightning McQueen! 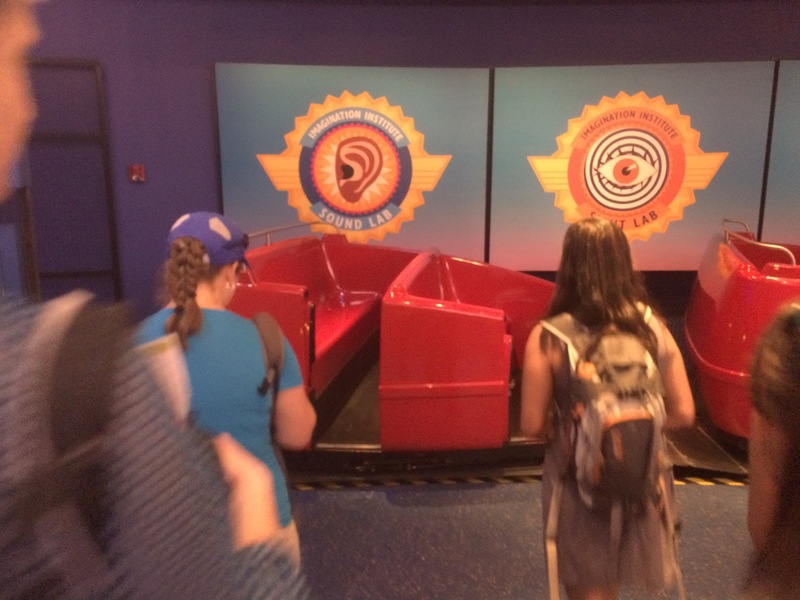 They were on the way to Test Track. Buzz Lightyear was, of course, my absolute favorite. 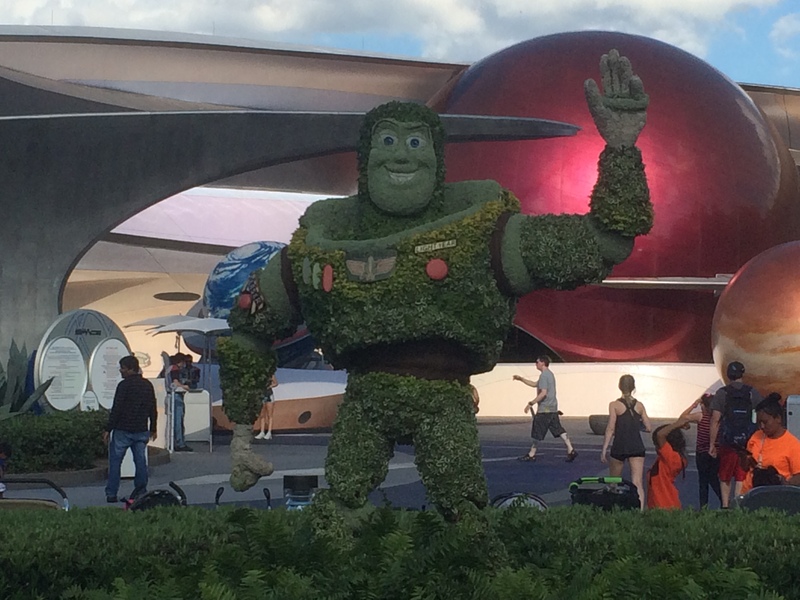 They put Buzz in the absolutely perfect place…outside Mission: Space. 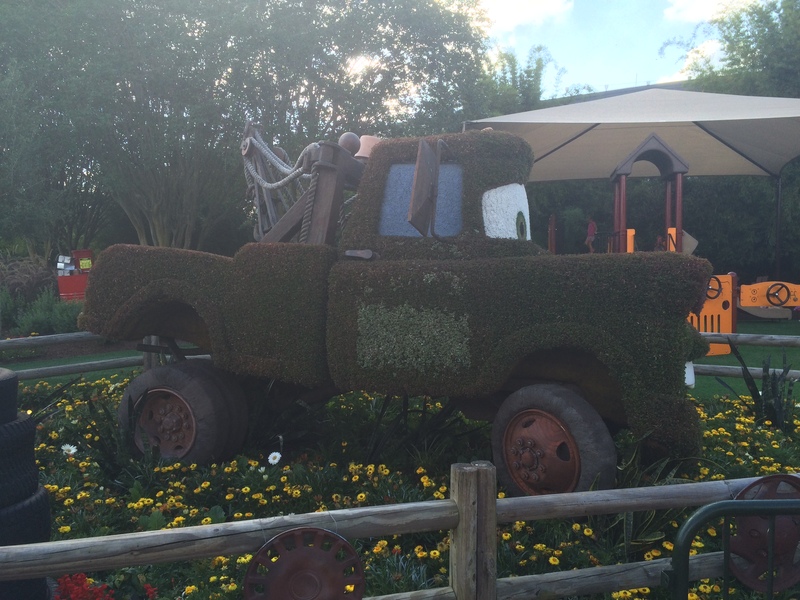 The search for the last topiary took us to the back of future world. 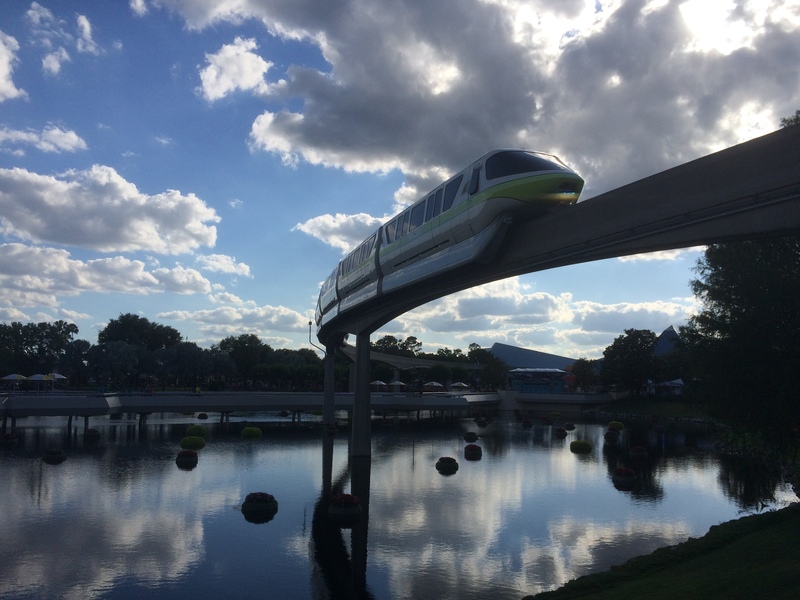 Along the way, I saw the monorail coming by and snapped this picture. 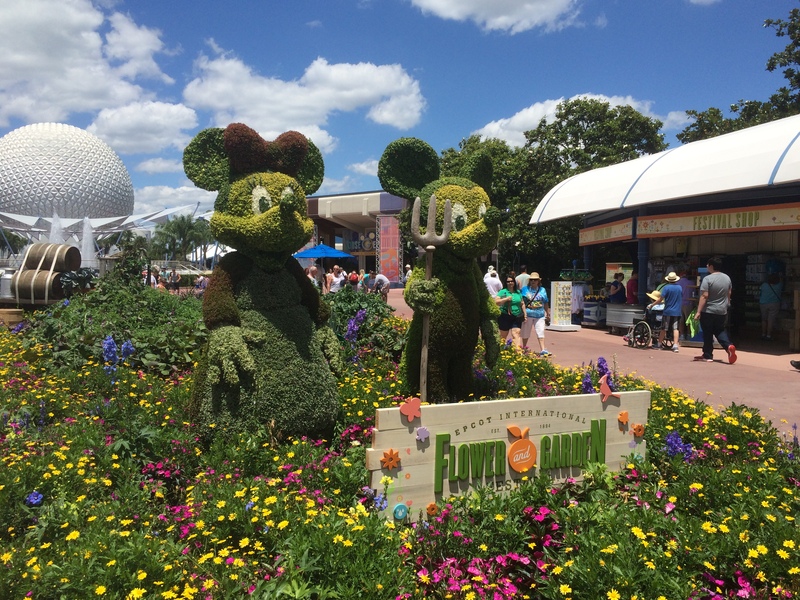 We passed by farmer Mickey and Minnie again. 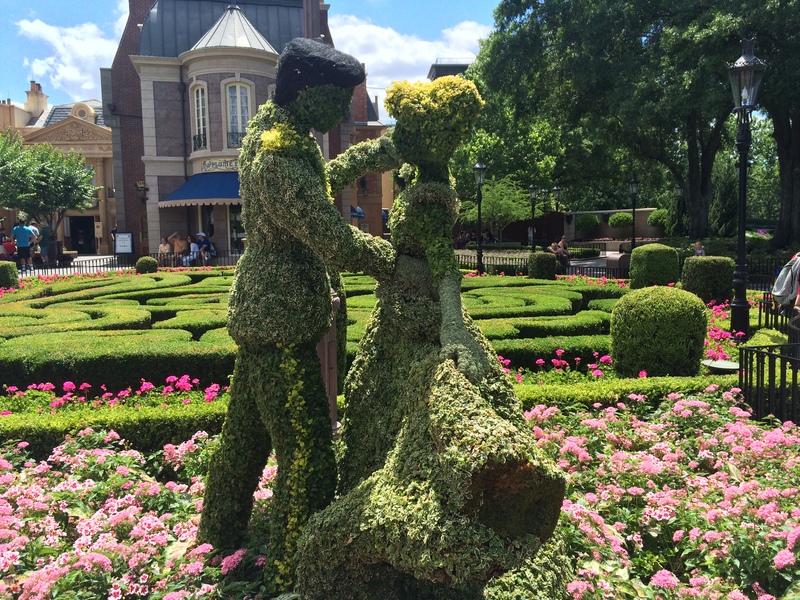 My sister-in-law found the final topiary! I can’t remember what it is. However, we were happy to get the final one! 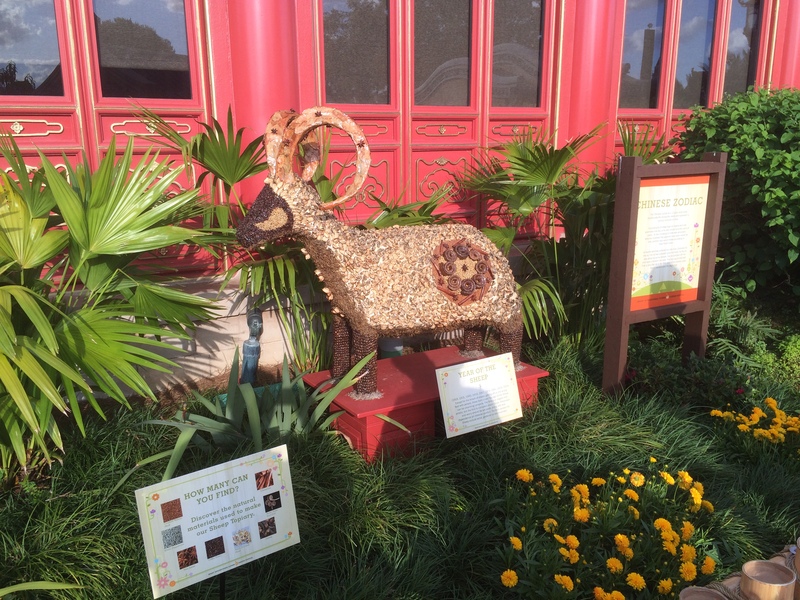 This guy was close to the Mexico Pavilion. 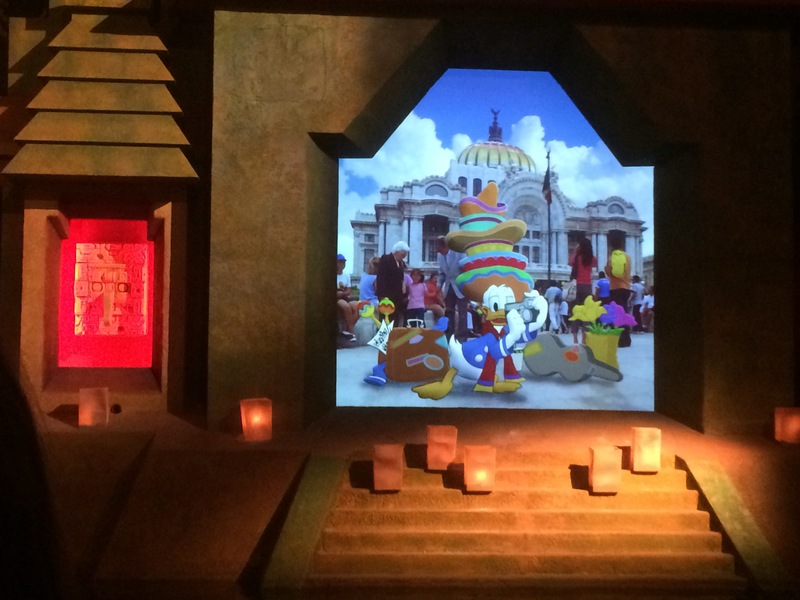 I love the inside of the Mexico Pavilion! 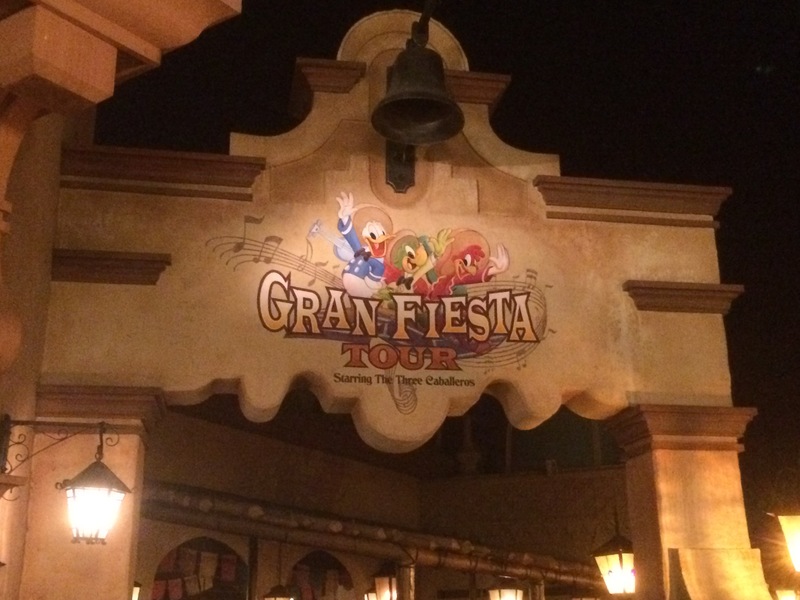 Since we were in Mexico, we headed on the Gran Fiesta Tour with the Three Cabilleros. 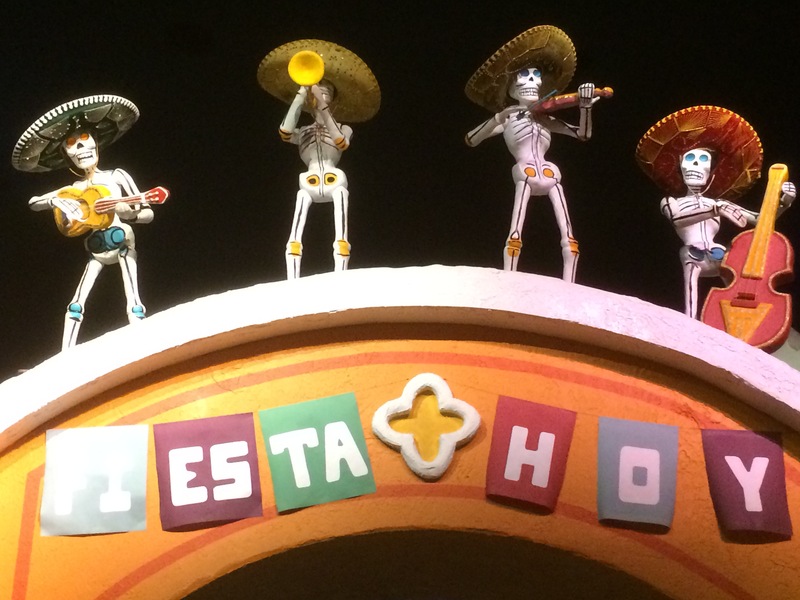 Love the Skeleton Mariachi band! 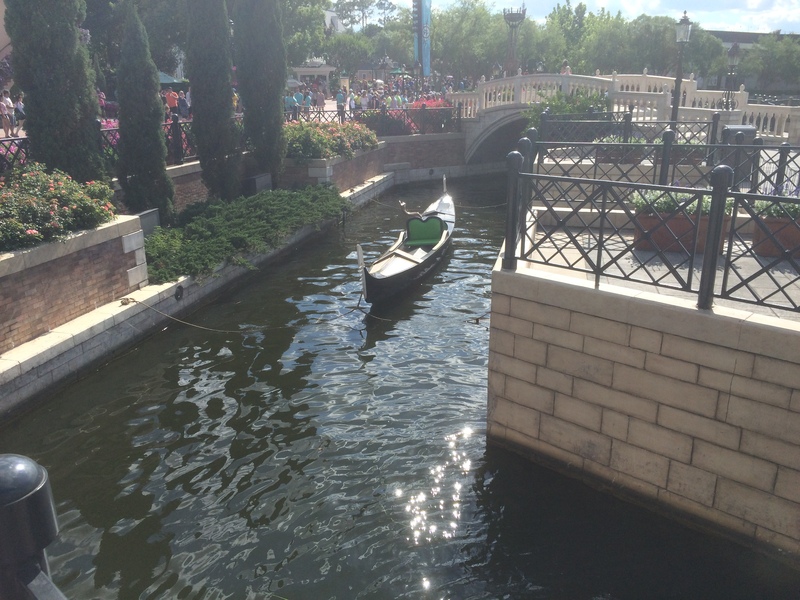 As we began looking at waiting times, heading over to the Seas with Nemo & Friends worked best. If you’ve never been, this is basically what would happen if the Little Mermaid at Disney California Adventure met the Nemo Subs at Disneyland. 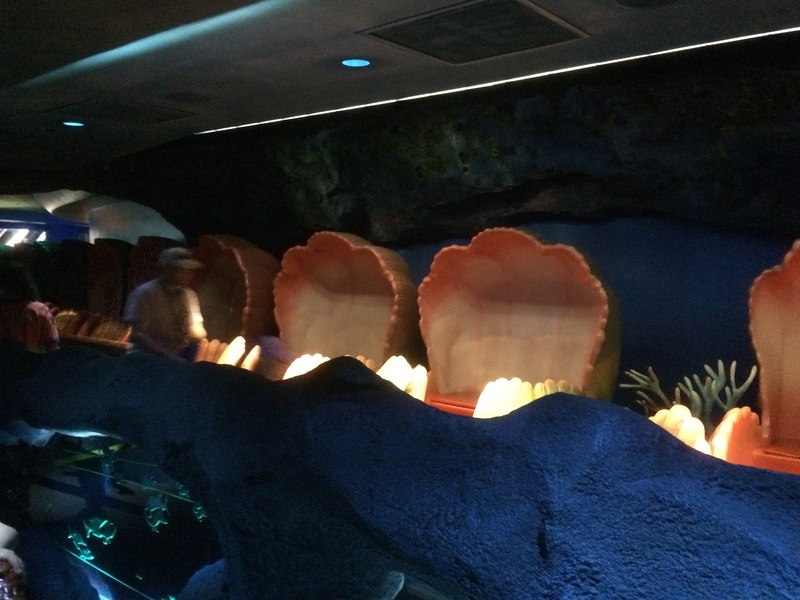 You ride clam shells, like the Little Mermaid. 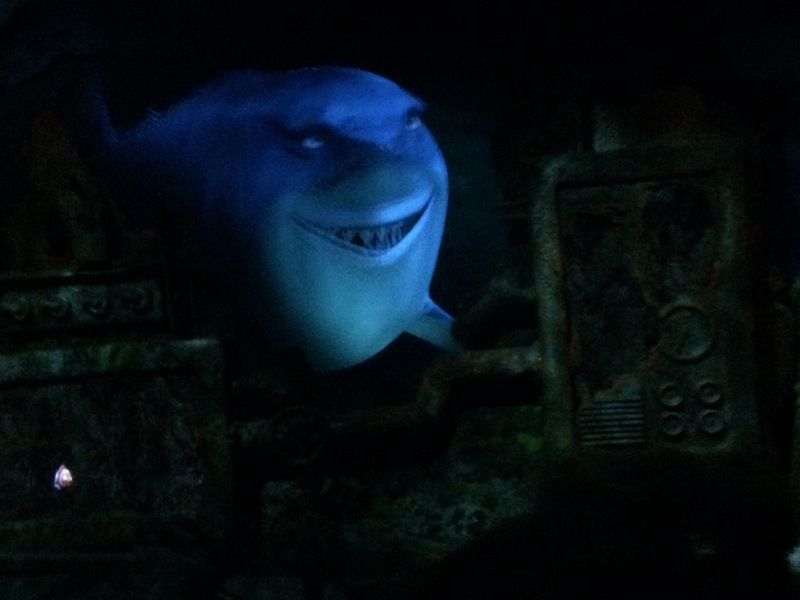 However, the ride itself is basically the Nemo Subs. Fish are friends…not food! 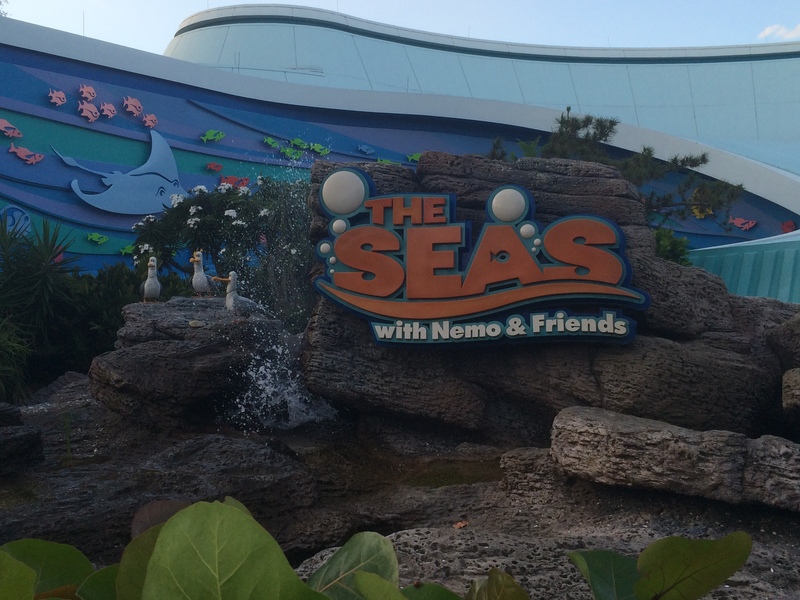 The Seas with Nemo & Friends drops you off inside the aquarium in the Seas Pavilion. 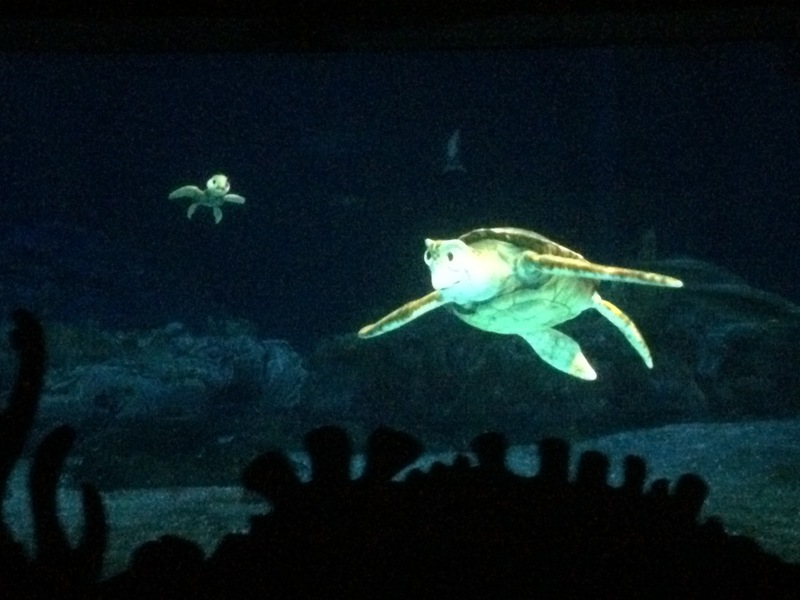 I love the aquarium. Look! 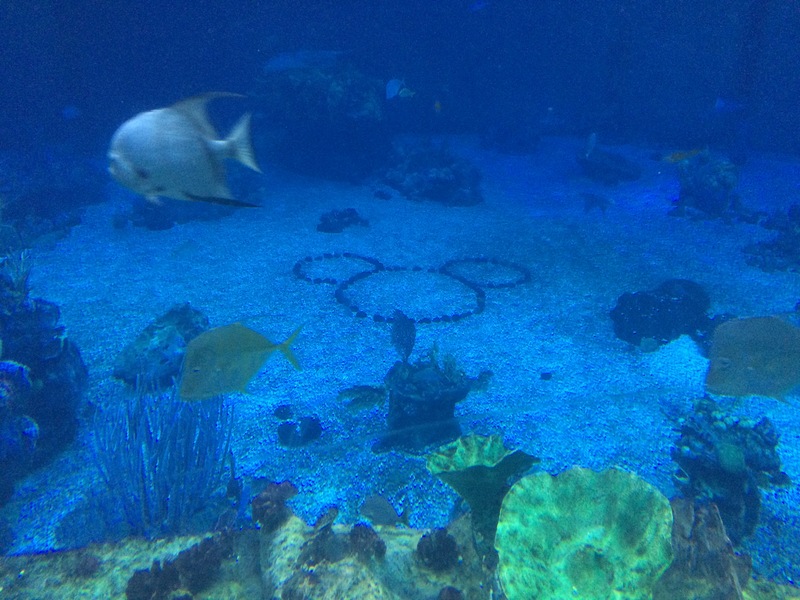 A hidden Mickey! After the Seas Pavilion, we headed off to the Land Pavilion for dinner. 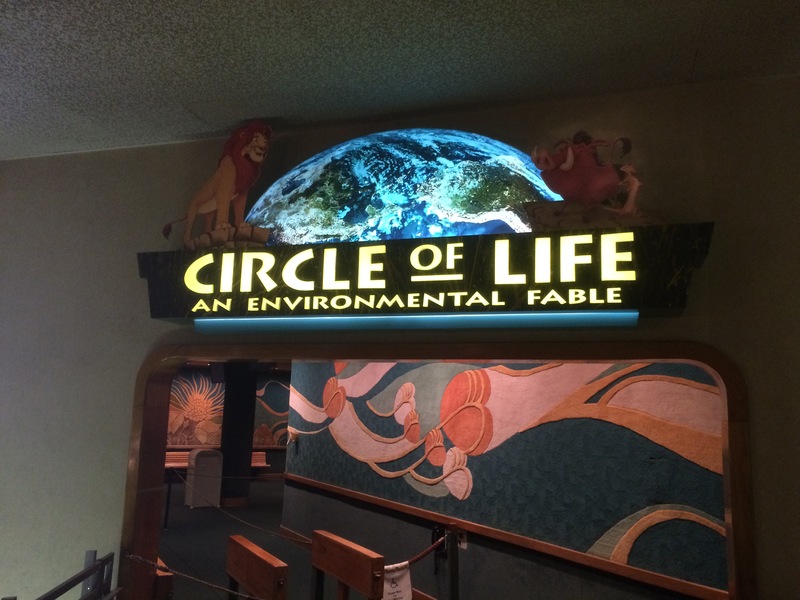 We passed by the Circle of Life attraction on the way. The food court looking place in the Land Pavilion offers some really good food for a counter service restaurant. If you don’t have reservations at the many amazing world pavilion showcase restaurants, I highly recommend dining at the Land Pavilion. 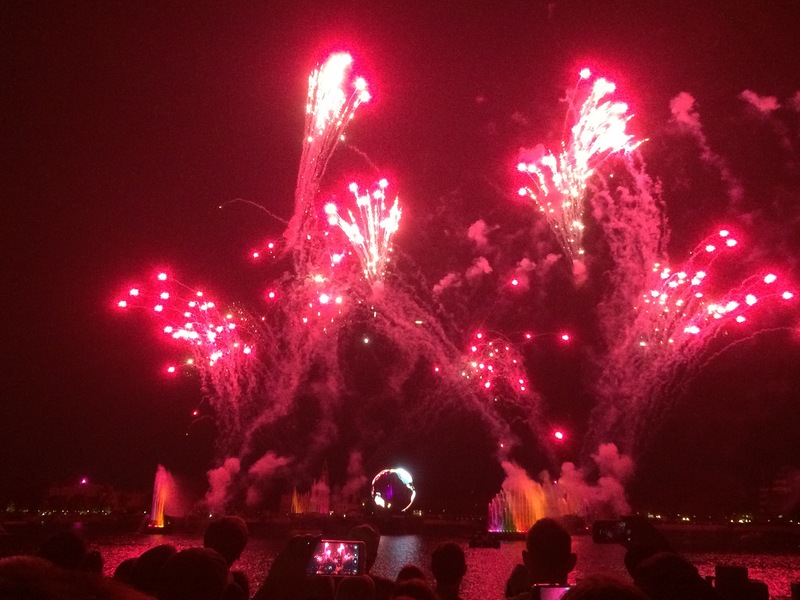 We finished dinner just in time to find a spot for Illuminations: Reflections on Earth. 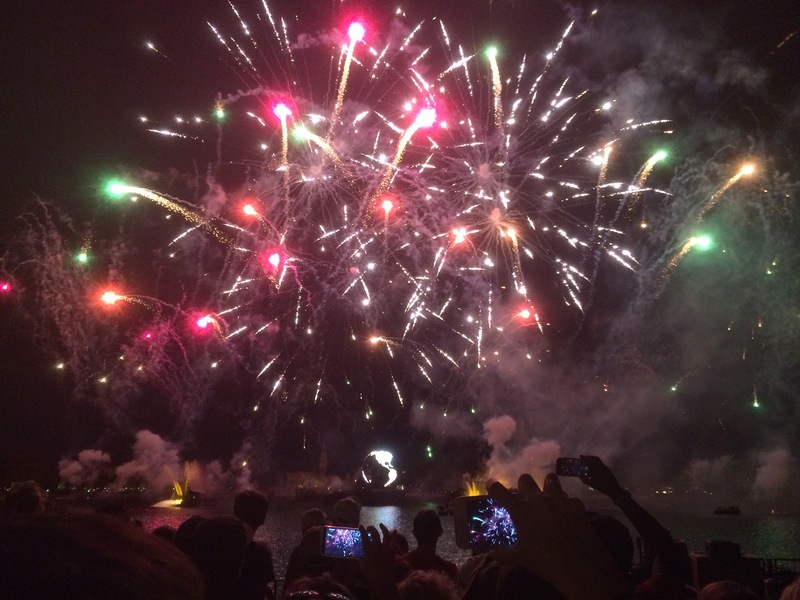 I absolutely love Illuminations! 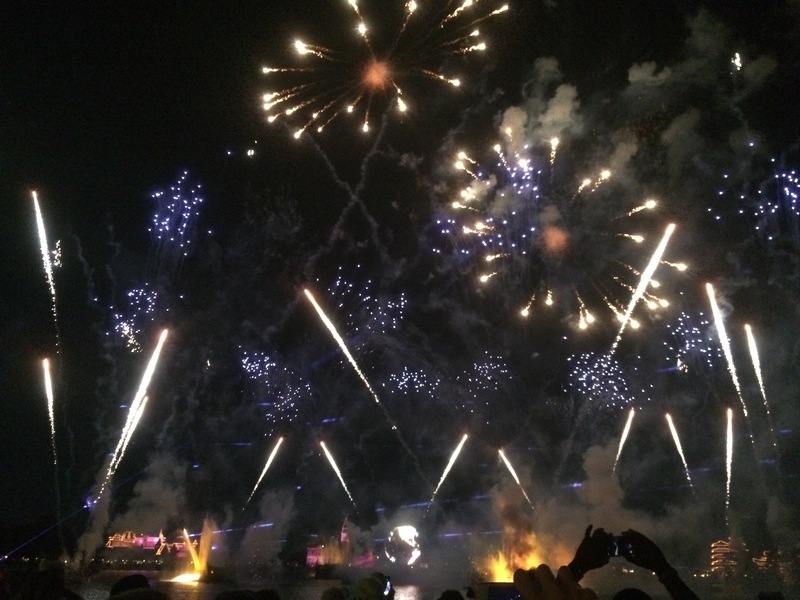 This is my favorite night time show at Walt Disney World! 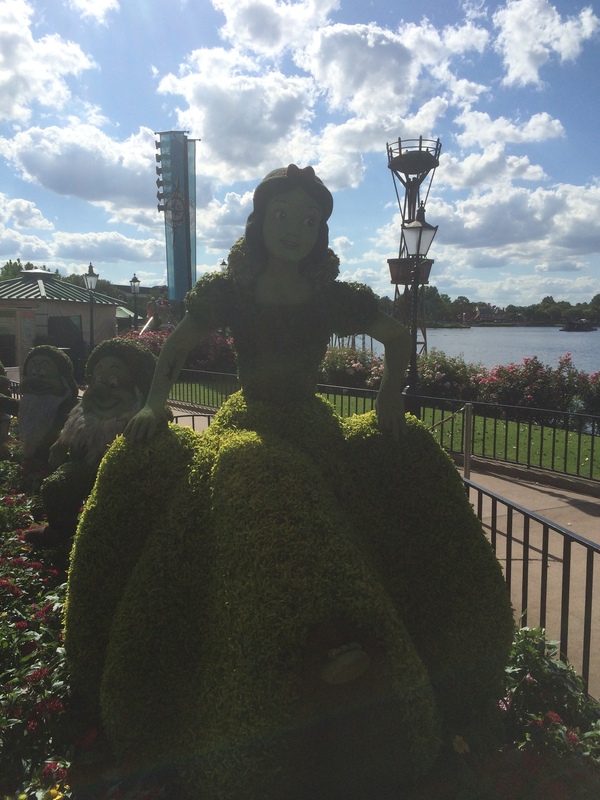 It is NOT to be missed if you ever visit Walt Disney World. 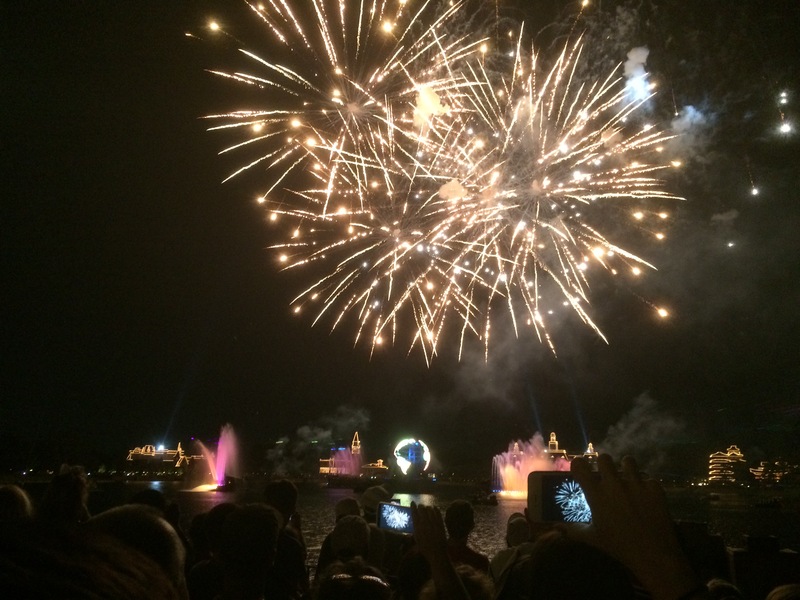 After Illuminations, it was time to head out. 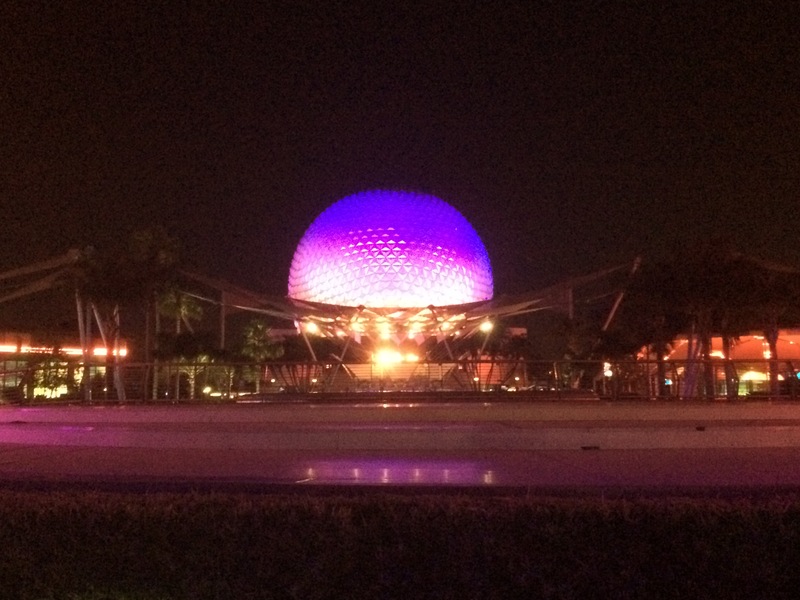 Spaceship Earth looks AMAZING at night! 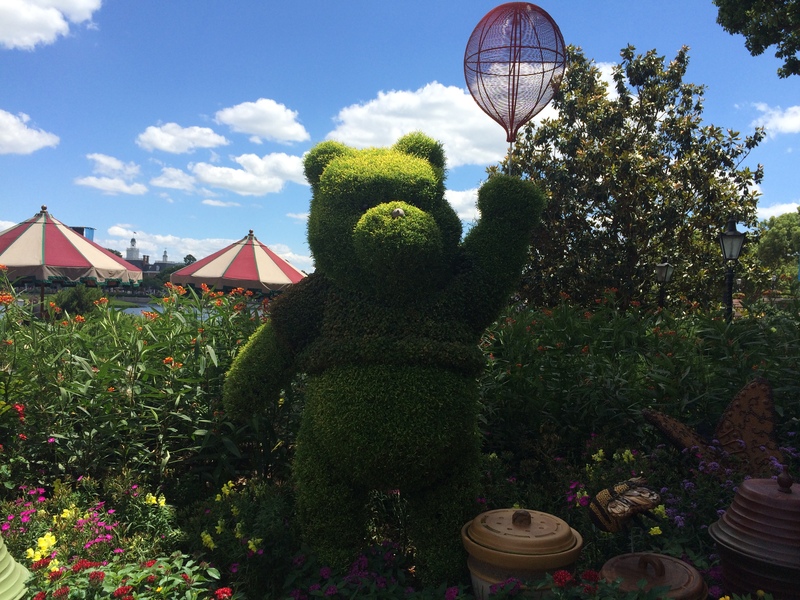 EPCOT was amazing! 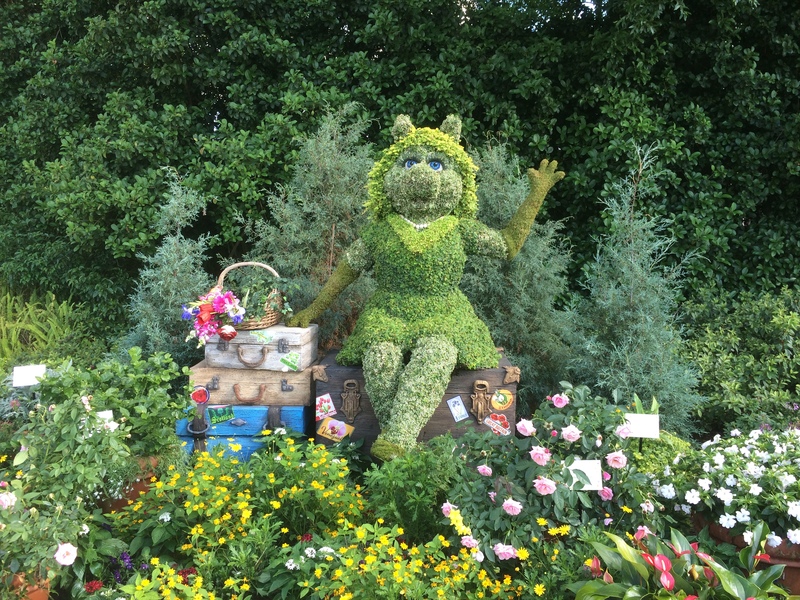 I loved all the extras for the flower and garden festival. It was such a cool addition! 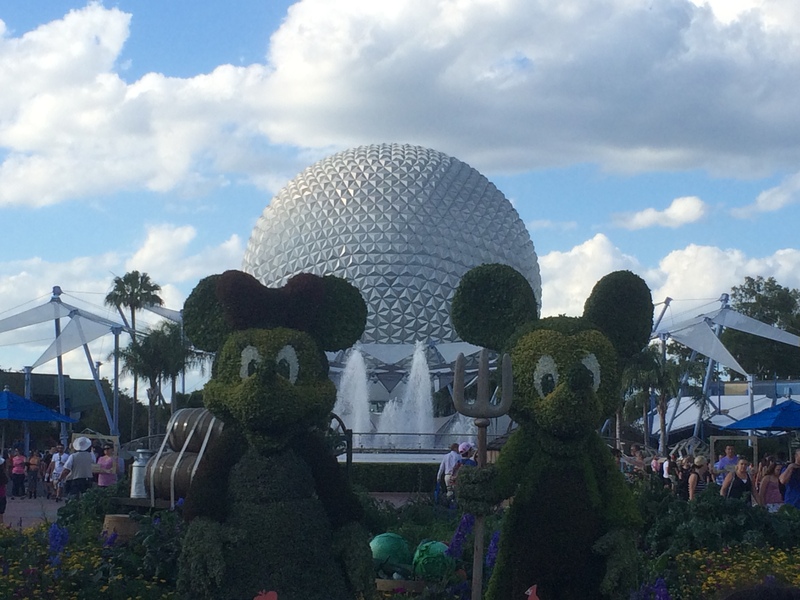 Leaving EPCOT was a little sad because I knew we only had one more full day at Walt Disney World. 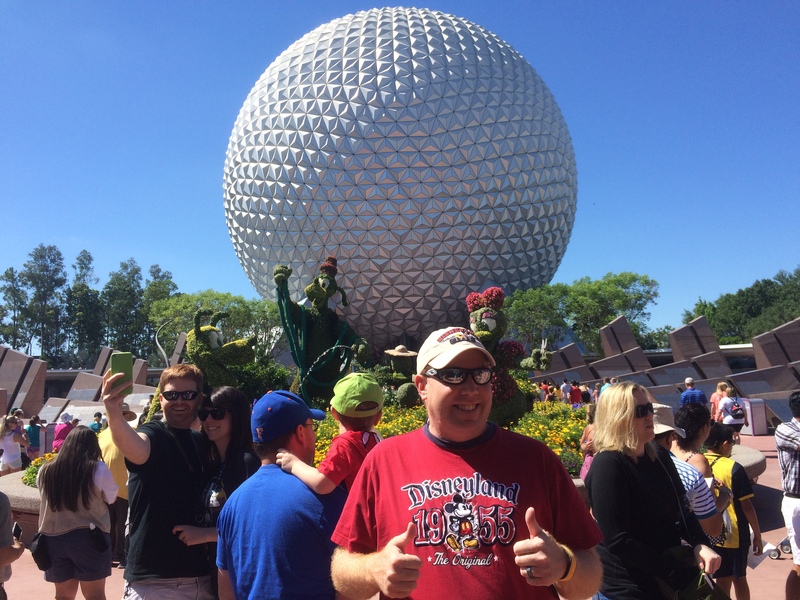 There are times where I envy those who can make it out to Walt Disney World at least once a year. This was one of those times. 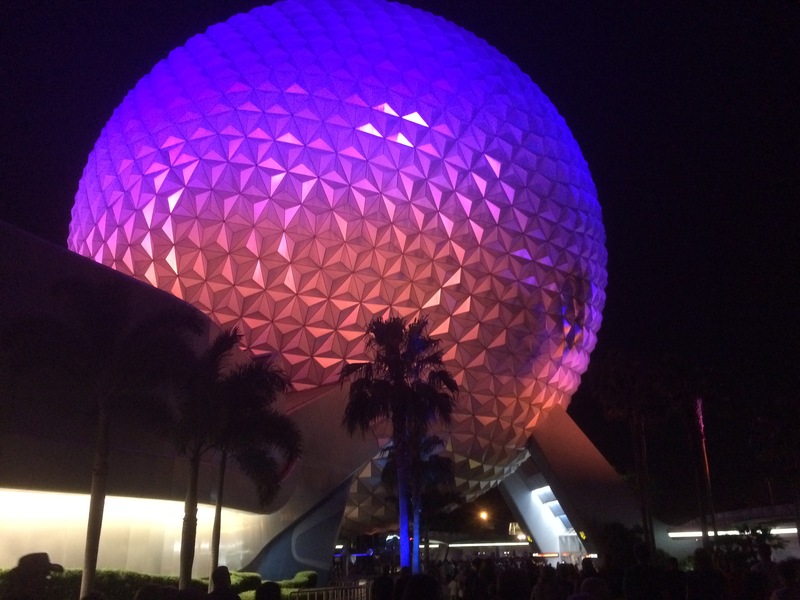 If Disney could copy one of their Florida theme parks in California, I’d want it to be EPCOT. Anyways, great day and can’t wait until I get a chance to go back! If only I knew when that would be. 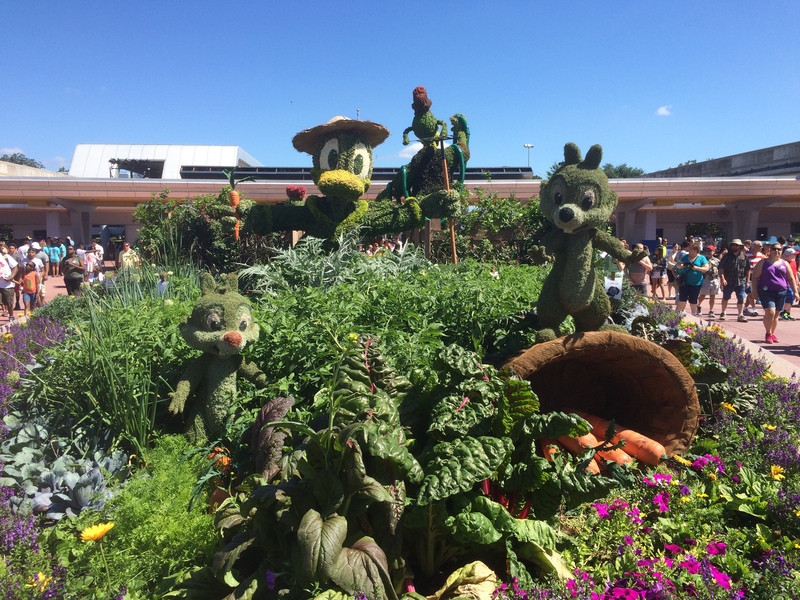 Have you been to EPCOT during their flower and garden festival? What did you think? great recap! I saw all of the toparies at Princess (since flower and garden started the week after) but I have always wanted to go back and do the food booths! 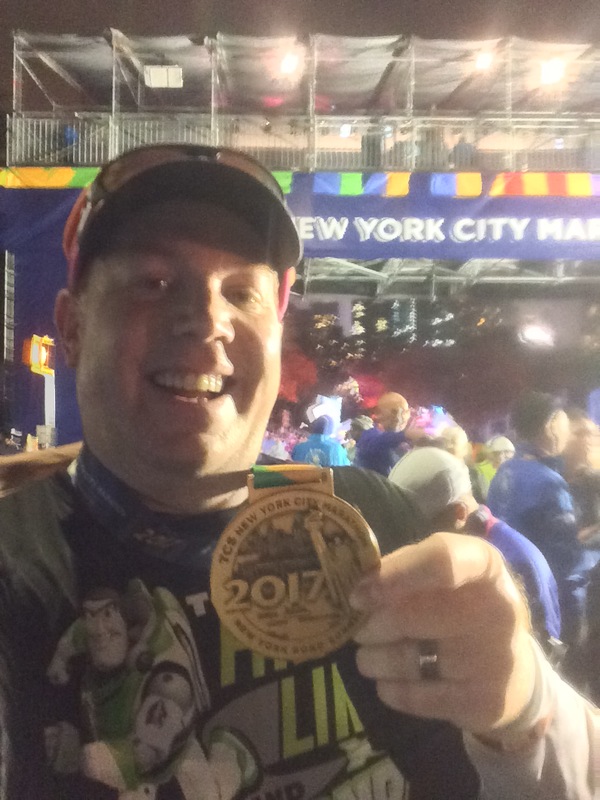 if the rumors are true, hopefully we will have a may wdw race to make that happen!